I have a new poem in the most recent issue of The Maynard! It’s all about breaking bones and hearts! Heya fellow medievalists and fantasy-enthusiasts. I’ll be attending 2 medieval conferences in the new year. From May 9-12 I’ll be at the International Congress on Medieval Studies at the University of Western Michigan in Kalamazoo. I’ll be presenting a paper on medievalism on YA literature, and I’ll also be part of a roundtable focused on problems within the discipline. From July 1-4 I’ll be at the IMC in Leeds, presenting on “dangerous wizards” in young-adult texts. Feel free to find me if you’re at either of these events! Coffee, chatter, and “oohing” over medieval books is always welcome. I reviewed a forthcoming collaborative book–Autoethnography and Feminist Theory at the Water’s Edge: Unsettled Islands. Edited by Sonja Boon, Lesley Butler, and Daze Jeffries, and forthcoming from Palgrave Press. An excellent mix of creative/critical essays from an elemental perspective, including discussion of trans and nonbinary identities in a Canadian context. Tonight at 6:30 PM I’m doing an interview on Regina’s CJTR Community Radio [for their Just Drawn That Way podcast]–we’ll be chatting about my recent class on Buffy the Vampire Slayer. Feel free to have a listen here. I’m giving a seminar on New Directions in Medieval Studies as part of the University of Regina Department of English’s Proseminar Series. We’ll discuss ecologies, medievalism(s), and disability studies, as well as what Medieval Studies can offer! Click here for a larger version of the poster. I delivered a talk on Old English literature and disability studies, entitled “Blue Histories: Thinking With Sadness in the Middle Ages,” as part of the Orlene Murad series at the University of Regina. Afterwards we discussed medieval representations of the body, and how medieval literature may represent a challenge to current narratives of cure (see Eli Clare’s wonderful work on this in Brilliant Imperfection). Click Omad_pdf for a larger version of the poster. I wrote a blurb for Ken Mondschein’s Game of Thrones and the Medieval Art of War, published by McFarland Press (who also published Mastering the Game of Thrones). If you have burning questions about Valyrian steel or just want to know more about medieval arms and armour, check it out! 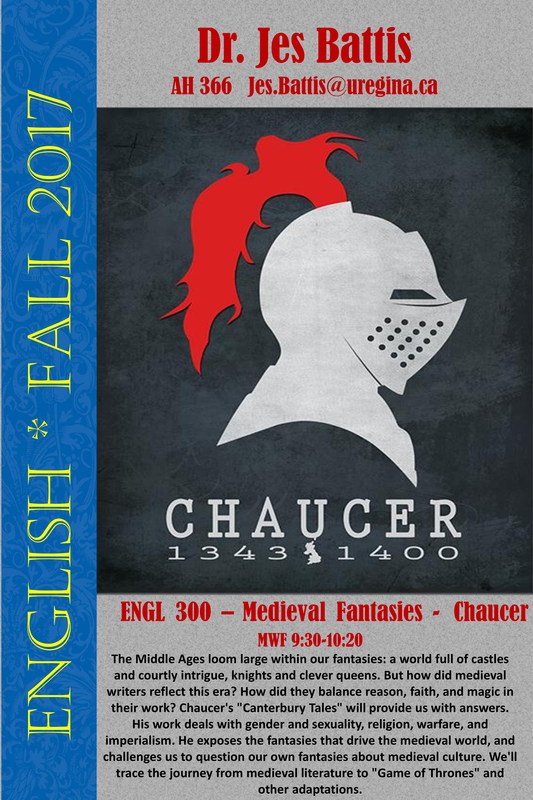 I’m teaching a Chaucer course in the Fall, which focuses on Chaucerian fantasy and the supernatural: from sorcerers to zombies. 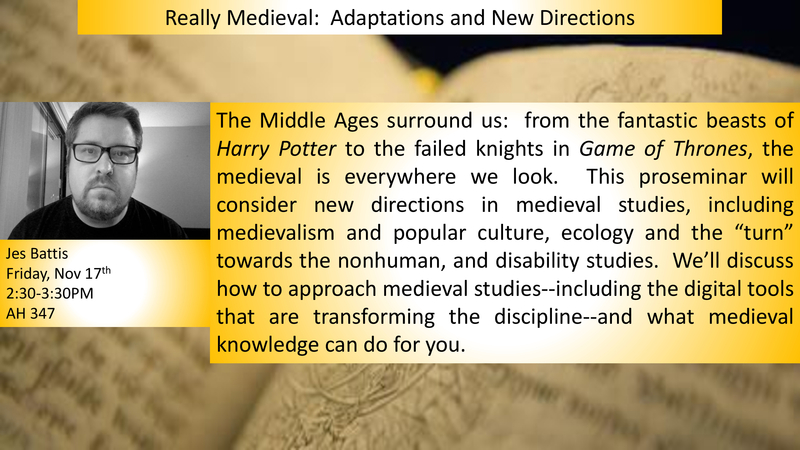 We’ll also look at medieval adaptations like Game of Thrones, and our various shared fantasies about the medieval era. Click here to check out the poster. Next month I’ll be part of a panel on Old English Elegies at the 2017 International Medieval Congress in Kalamazoo. I’m particularly excited about this panel because we’ll be talking about the role of queerness in Old English poetry, with a nod towards “queer” as something with multiple meanings: strange, ambivalent, untranslatable. We’ll be talking about Maxims, Beowulf, and other poems, on May 12th at 3:30. I’ll be the guy with the cane. I had the pleasure of participating in a roundtable discussion on adapting medieval research to genre fiction, including fantasy, YA and children’s literature. I couldn’t have asked for two better panelists: Kim Zarins (Sometimes We Tell the Truth) and Sandra Evans (This is Not a Werewolf Story). We talked about how to avoid getting lost in the details, and how the academic world could be more receptive to nontraditional writing about research. Literary Wonderlands is now available for purchase! The book, edited by Laura Miller and including work by Lev Grossman, features gorgeous maps and detailed discussions of fantastic landscapes. I have a piece on Game of Thrones, and I’m quite excited by the visual content. Books like this remind us that fantasy literature is all about mapping, discovery, and adventure. Order from IndieBound. I have an article on eighteenth century slang and sexuality coming out in Volume 36 of Lumen, the journal of the Canadian Society for Eighteenth Century Studies. It focuses on gay bar culture in eighteenth century London and the unique language that developed between different subcultures, eventually leading to queer dialects like Polari. Literary Wonderlands is available for presale. This anthology features essays on created worlds, and is wonderfully illustrated. I have a piece on Game of Thrones, and other contributors include author Lev Grossman, Tolkien scholar Tom Shippey, and fantasy critic Farah Mendlesohn. The collection is edited by author Laura Miller. Contributing a piece on George R.R. Martin/Game of Thrones to Literary Wonderlands, an illustrated book published by Elwin Street. Various contributors discuss fantasy worlds like Westeros, Narnia, and IQ84. Edited by Laura Miller.